Cataract surgery patients, as well as anyone with presbyopia seeking improvements to their overall vision, now have their choice of several different intraocular lenses to replace the aged, cloudy natural lens. These replacement lenses are now equipped with the capabilities to improve vision at all distances by utilizing the eye’s natural accommodating power. 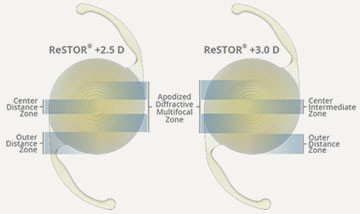 Two of the most popular IOLs include: ReSTOR®, and ReSTOR® Toric Multifocal, which are all FDA-approved for the correction of near, far and intermediate vision. Each implant works in a slightly different way, so it is important to learn more about these lenses in order to find out which one is right for you. Your doctor will assist you in this decision during your consultation before surgery. Multifocal IOLs have been used for years to help patients enjoy clear vision after cataract surgery. The advanced ReSTOR® lens improves upon ordinary IOLs by providing a full range of focusing distances. A series of 12 gradual “step heights” create seamless focusing ability from near to far, while the edge of the IOL enhances distance vision. A feature called apodization also helps the eye distribute light evenly in different lighting conditions. Best of all, up to 80% of patients who use the ReSTOR® lens don’t need glasses or contact lenses after surgery.